The growing trouble and violence in our towns and cities means we need an effective defence against un-provoked attacks. Chongshin Do is an evolved Martial Art designed to be practical in todays society. Gone are the days of fighting Samurai on horse back. Chongshin Do is a dynamic, fast moving, exciting and effective Martial Art System. Chongshin Do is not a style that will beciome stale as it will continue to grow and evolve with emphasis on realistic techniques for self-defence and attack. Chongshin Do still retains the style and grace of the traditional Martial Arts. Chongshin Do is a multi style Martial Art thst incorporates some of the best known and most effective Martial arts. A student will learn a vast amount of techniques and different ranges that will enable him/her to defend themselves more effectivly. With regular practice these techniques will become second nature. Chongshin Do will improve reflexes, speed and power - knowing this will increace confidence and self assurance. The kicks and striking techniques used in Taekwondo and Kickboxing interlock perfectly with the "close in" work of Jujitsu and Aikido.Chongshindo incorporates these two styles with a syllabus for each, keeping each student motivated and continualy moving forward towards Black Belt with regular gradings and competitions. To find out more on the styles taught see the Disciplines pages. Size and strength are not essential as effective self defence requires good technique. Everyone, Men , Women and Children can benifit from Chongshin Do regardless of previous expirience, fitness or ability. Chongshin Do is a discipline that exercise the mind and body , building stamina, increacing suppleness and flexability. 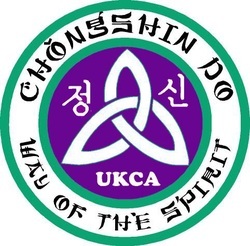 chongshin Do offers many areas of growth, learning and development. Many of these can be put into two main categories. Chongshin Do will help a student to a new level of fitness. The term "fighting fit" will be apparent as the keen motivated student works hard each lesson making him/her forever fitter and stronger. Achieve and maintain a high level of: FITNESS, AGILITY, CO-ORDINATION, FLEXIBILITY, BALANCE. Improve: REFLEXES, ENDURANCE andSTAMINA. develop: SKILL, SPEED, POWER, FOCUS and SPIRIT. With teaching the concepts and philososphy of traditional Martial arts, a student can grow both mentaly and spiritualy. As in ancient times the martail arts are a vehicle for spiritual and self enlightenment. A journey of expiriences from which to learn and develop. Achieve and maintain a high level of self confidence, self esteem, motivation, discipline, self discipline, respect, self respect, concentration, perseverence, focusand positive thinking. With the practice of meditations students have found enlightenment and inner peace, relaxation and stress management. What does a lesson cosist of ? A typical lesson will start with a warm up, including a full body loosening up program to release and relax muscle groups throughout the body , followed by stretching and concentration exercises you are ready to start. Then the lesson will consist of moves and combinations relevent to the grades of the students. Beginners will start with basic punching, some simple blocks and kicking techniques. All this will develop and a keen and motivated student can expect to progress quite rapidly with regular practice. As a student masters a particular technique then onto another and the continual learning process begins. Lessons can include - Technique grooming - Sparring - Wrist locks & holds - Bag work and much much more. Rounding the lessons of with relaxation, stretching and meditation balances and harmonise the mind and body. For more information on classes please call for a FREE information pack. Belt system to encourage the student to continue the learning proccess and become a fitter stronger individual - Yellow Belt - Green Belt - Blue Belt - Red Belt and on to Black Belt! is an evolved Martial Art. Gone are the days of Samurai on horse back. is a style that will not become stale as it will continue to grow and evolve with emphasis on realistic techniques for self-defense and attack. however still retrains the style and grace of the traditional Martial Arts. and has put the required amount of hours training in. These are only £20 each - right up to black belt.